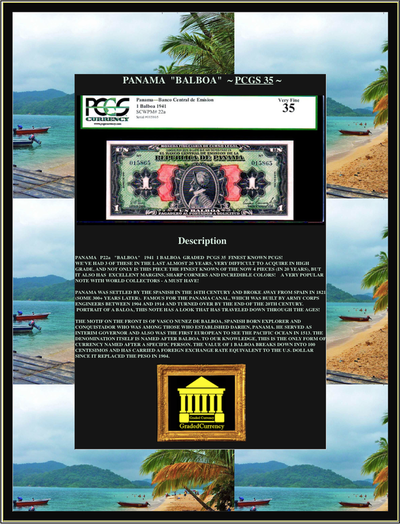 PANAMA P22a "BALBOA" 1941 1 BALBOA GRADED PCGS 58PPQ FINEST KNOWN PCGS! IT CERTAINLY POSSESS ALL THE ATTRIBUTES NEEDED FOR THE STATUS. WE'VE HAD 4 OF THESE IN THE LAST ALMOST 20 YEARS, VERY DIFFICULT TO ACQUIRE IN HIGH GRADE, AND NOT ONLY IS THIS PIECE THE FINEST KNOWN OF THE NOW 4 PIECES (IN 20 YEARS), BUT IT ALSO HAS NEARLY PERFECT BALANCED MARGINS, SHARP CORNERS AND INCREDIBLE COLORS NOT TO MENTION FRESH ORIGINAL PAPER (AS EVIDENCED BY THE PPQ)! THIS PIECE (BALBOA) IS HIGHLY SOUGHT AFTER, AND IS GENERALLY NEVER SEEN ABOVE FINE CONDITION (LOW GRADE). WE ALSO HAVE ANOTHER PIECE IN OUR STORES AND SITE IN PCGS 35 (VERY FINE). VERY RARELY IS THIS PIECE OFFERED IN THE OPEN MARKET IN SUCH HIGH GRADE - DON'T MISS OUT, THE OPPORTUNITY WON'T COME AGAIN! TRULY MEANT FOR THE MOST DISCRIMINATE OF COLLECTIONS! PANAMA WAS SETTLED BY THE SPANISH IN THE 16TH CENTURY AND BROKE AWAY FROM SPAIN IN 1821 (SOME 300+ YEARS LATER). FAMOUS FOR THE PANAMA CANAL, WHICH WAS BUILT BY ARMY CORPS ENGINEERS BETWEEN 1904 AND 1914 AND TURNED OVER BY THE END OF THE 20TH CENTURY. 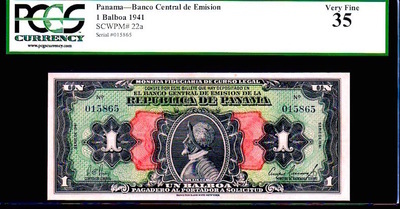 PORTRAIT OF A BALOA, THIS NOTE HAS A LOOK THAT HAS TRAVELED DOWN THROUGH THE AGES! THE MOTIF ON THE FRONT IS OF VASCO NUNEZ DE BALBOA, SPANISH BORN EXPLORER AND CONQUISTADOR WHO WAS AMONG THOSE WHO ESTABLISHED DARIEN, PANAMA. HE SERVED AS INTERIM GOVERNOR AND ALSO WAS THE FIRST EUROPEAN TO SEE THE PACIFIC OCEAN IN 1513. THE DENOMINATION ITSELF IS NAMED AFTER BALBOA. TO OUR KNOWLEDGE, THIS IS THE ONLY FORM OF CURRENCY NAMED AFTER A SPECIFIC PERSON. 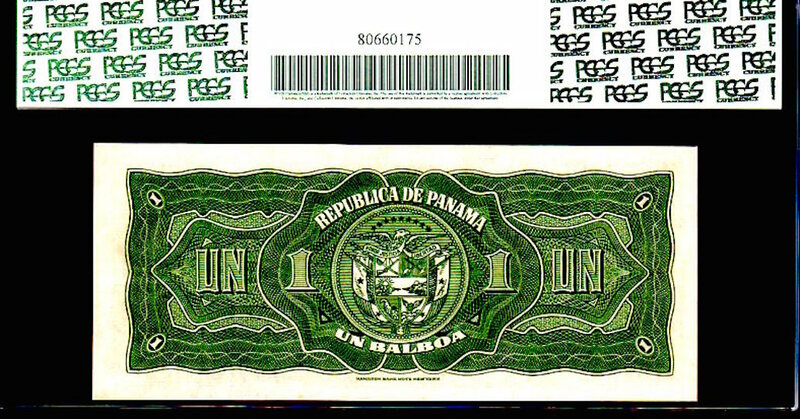 THE VALUE OF 1 BALBOA BREAKS DOWN INTO 100 CENTESIMOS AND HAS CARRIED A FOREIGN EXCHANGE RATE EQUIVALENT TO THE U.S. DOLLAR SINCE IT REPLACED THE PESO IN 1904. 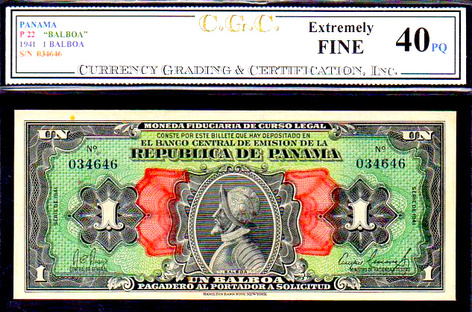 PICK # 22 PANAMA 1 BALBOA GRADED CGC 40PQ - 2ND FINEST EVER GRADED BY CGC!!! 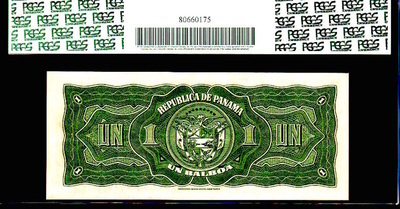 THIS NOTE TYPE IS EXTREMELY POPULAR WITH VARIOUS COLLECTORS AND JUST DOESN'T COME IN ANY HIGHER GRADE! THIS PIECE FACES UP AS AN UNC. AND HAS THE LOOK OF A GEM! BEAUTIFUL COLORS, MARGINS AND CORNERS! 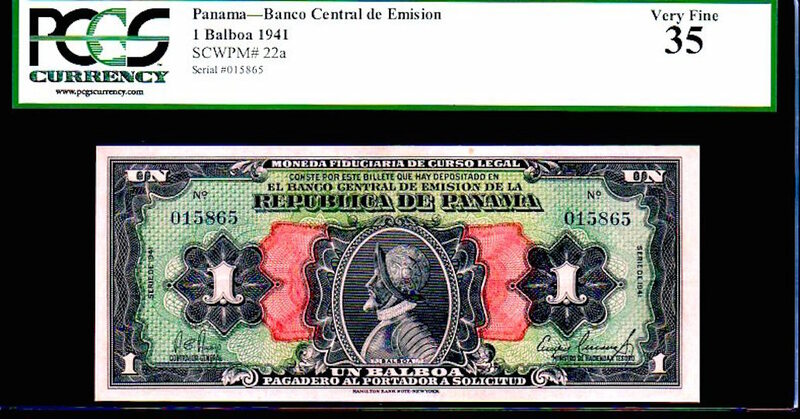 PANAMA P22a "BALBOA" 1941 1 BALBOA GRADED PCGS 35 FINEST KNOWN PCGS! WE'VE HAD 3 OF THESE IN THE LAST ALMOST 20 YEARS, VERY DIFFICULT TO ACQUIRE IN HIGH GRADE, AND NOT ONLY IS THIS PIECE THE FINEST KNOWN OF THE NOW 4 PIECES (IN 20 YEARS), BUT IT ALSO HAS EXCELLENT MARGINS, SHARP CORNERS AND INCREDIBLE COLORS! A VERY POPULAR NOTE WITH WORLD COLLECTORS - A MUST HAVE!